Article Objective: To highlight vitamins and supplements that are moderate-to-strong triggers for many rosacea sufferers. This article will detail specific vitamins and supplements that are common rosacea trigger offenders and include recommendations on various ways to take these supplements to reduce adverse reactions, if possible. Very few rosacea sufferers realize that vitamins and supplements can trigger rosacea, thus making them aware of this fact and naming the most common triggers allows them to know and evaluate supplements that they are taking and remove said for a while to determine if it was a rosacea trigger or adjust intake or dosage. In today’s world most people take multiple doses of supplements throughout the day to keep the body healthy, increase mental alertness, enhance muscle performance during exercise, reduce stress, increase weight loss (i.e. increase metabolic rate and thermogenesis), dilate blood vessels to the heart to help prevent cardiovascular disease, and increase the activity of mitochondria in each cell to stimulate anti-aging actions at the cellular level. Other specialty supplements help support organ function such as stimulating detoxification within the liver — and even triggering the growth of new healthy cells within the liver, enhancing kidney filtration to increase function and overall health, enhancing the health of the heart by triggering growth of new cardiac myocytes (muscle cells), enhancing lung function and alveolar oxygen uptake, increasing the activity of absorption enzymes throughout the small intestine for better nutrient uptake and enhancing eyesite by improving the function of rods and cones within the retina of the eyes. Many of these supplement-induced benefits to the human body are, at the same time, deleterious to rosacea-affected skin. A prime example centers around vitamins and supplements that increase blood flow throughout the body. Healthy blood flow is key to healthy organs, brain activity, heart health and energy. Healthy blood flow is needed to deliver key nutrients and oxygen to every cell in the body and remove cellular waste that quickly builds up in and around each cell; however spikes in blood flow to rosacea-affected areas in the facial skin often trigger rosacea flares. It seems counter intuitive but the fact remain – weak, fragile blood vessels combined with inflamed skin cells and physical damage to collagen and elastin make rosacea skin highly reactive to increased blood flow and many other events that may be good for the rest of the body. Increase in Blood Flow — many supplements dilate blood vessels and increase blood flow. Most increase blood flow throughout the entire body which would affect rosacea skin; however some dilators specifically increase blood flow to certain organs such as the brain, heart, kidney, lungs and the spleen. Selective increases in blood flow just to organs should not trigger rosacea flares. Increase in Thermogenesis — some specialty supplements are designed to increase thermogenesis or internal body heat. Increases in body heat often lead to flushing of the face and thus are often bad for rosacea skin. Increase in Metabolism — many supplements are designed to increase metabolism. Metabolism is a term that is used to describe all chemical reactions involved in maintaining the living state of the cells and the organism. Obviously it is important to have a healthy metabolism in order to maintain a healthy body. However, some of these supplements cause large increases in metabolic activity that create surges of energy but are not necessary for normal functioning of the body. One of the main energy sources released from the mitochondria (cellular energy organelle in each cell) is ATP. The National Rosacea Society has identified ATP as a strong trigger for rosacea redness and outbreaks when produced in concentrations higher than the norm. Stimulate the Release of Dilator Hormones — some supplements stimulate the release of dilator hormones from the small intestine and the adrenal glands. This usually results in a pronounced flush in the facial region that may last 12 to 24 hours. Stimulate Dilator Nerves — a few supplements can pass through the blood brain barrier and directly stimulate dilator nerves located in the anterior hypothalamus (the thermoregulatory center of the brain and one of the main stress centers). Activation of these nerves causes widespread dilation that mimics the ‘fight-or-flight’ response. Stimulate Immune Cell Activity — many supplements are designed to stimulate the immune system to help the body protect itself from colds, viruses and pathogens. The main problem with most immune cells is that they often exacerbate rosacea inflammation. Immune cells erroneously think that the facial skin is under attack due to the degree of inflammation and blood flow. They then enter the facial skin and set up camp. One of the main jobs of immune cells is to gobble up inflamed cells because they see them as foreign invaders. More importantly, they release bursts of damaging free radicals that eat through skin cells and blood vessels — making the environment much worse. Thus stimulating the immune system with supplements often sends even more of these dangerous cells to rosacea-affected areas. High Doses of Vitamin A— Vitamin A is known for being a “‘skin beautifier” vitamin. At the proper dose of 10, 000 to 15,000 iu and taken in the right form (naturally occurring beta carotene) it is indeed an excellent supplement for rosacea sufferers.However, many use standard Vitamin A and use it at very high doses (25,000 to 50,000 iu) which is definitely not good for rosacea as it may stimulate an inflammatory response, delay healing and turn facial skin cells a bright orange-red hue which only exacerbates the outward rosacea symptoms. High Doses of Vitamin E— Vitamin E is also known for being a “”skin beautifier” vitamin. At doses of 100 to 150 iu in the form of d-alpha tocopherol this is an excellent supplement for rosacea sufferers. However, many Vitamin E supplements and Multi-Vitamins use 300 to 500 iu of Vitamin E is various forms that are not “skin-healthy”.At these doses, Vitamin E often causes bleeding of the gums, nose and ruptured blood vessels in the facial skin. Please stick to the proper dose and form when incorporating this vitamin into your health regimen. High Doses of Vitamin C— Vitamin C is a superb vitamin for rosacea sufferers. It not only strengthens blood vessels throughout the skin, but it stimulates the production of new collagen and elastin which helps to strengthen thin, fragile rosacea skin.The two variables that one must be cautious of is the use of pure, unbuffered Vitamin C (ascorbic acid) and the dose. If you take more than 250 mgs at a sitting there is a good chance that this high dose of unbuffered Vitamin C can cause gastric upset — which in turn, stimulates the release of multiple dilator and inflammatory hormones from the stomach and intestine — causing facial redness and flushing.Most M.D. Naturopaths and Certified Nutritionists recommend taking only buffered forms of Vitamin C (Chelated Vitamin C or Ester C) to prevent gastric side effects and in doing so, one can often take much larger doses — even taking 1,000 mgs several times a day. High Doses of B Vitamins — Referred to as vitamin B complex, the eight B vitamins— B1, B2, B3, B5, B6, B7, B9, B12 — play an important role in keeping our bodies running like well-oiled machines. These essential nutrients help convert our food into fuel, allowing us to stay energized throughout the day.B vitamins are excellent for rosacea sufferers in general; however, there are a few that you must keep tabs on because they often stimulate the release of dilator hormones and activate dilator nerves throughout the body if taken in large concentrations — and many B vitamins made for stress prevention and high-end multi-vitamins contain 2,000% to 16,500% above the Recommended Daily Allowance (RDA). Niacin is a popular B vitamin used to dilate blood vessels and convert carbohydrates into glucose.Rosacea sufferers should steer clear from pure niacin and use the “no-flush” form of niacin termed niacinamide. Vitamin B6 (pyridoxine HCL) is also a popular B vitamin that is used to dilate blood vessels to ensure delivery of other nutrients and supplements. The proper dose is 10 to 15 mgs although most supplements contain 1,000% or more which can lead to intense rosacea flushing. It is wise to stick to the RDA dose. Vitamin B12 is often used for disorders of nerves and hormones. At doses of 150 to 200 mgs this is an excellent vitamin for rosacea sufferers; however, many supplements contain 1,000 mgs or whopping 16,667% above the RDA which can activate various dilator nerves supplying the face. Please be cautious when using B Vitamins. The right form of B Vitamins and proper dose can help rosacea symptoms and flares while the wrong form and high doses can do the exact opposite. Coenzyme Q10 (and the newer Ubiquinol Body-Ready Version)— CoQ10 is an excellent supplement for heart health. However, this is a potent dilator that often causes rosacea flushing. The wisest approach to taking this supplement is to take 50 mgs daily for two to four weeks to let your body acclimate to the supplement (the average starting dose is 100 to 200 mgs). Don’t rush it and be sure to keep tabs on the number of times you flush or flare to determine if you can take this supplement. Green Tea Extract — this is usually an excellent supplement for rosacea sufferers due to its anti-inflammatory actions and skin-specific incorporation into the dermis. The main drawback to this supplement is that many rosacea sufferers take 500 mgs to 750 mgs which is well above the recommended dose and can cause tachycardia (high heart rate) and high blood pressure — both worsen rosacea symptoms. Most naturopaths treating rosacea recommend a steady low dose of 50 to 100 mgs per day with 50% EGCG, the main anti-inflammatory component. Ginko Biloba— Ginkgo biloba has been used medicinally for thousands of years. Today, it is one of the top-selling herbs in the United States. It is a potent dilator and increases cognitive abilities in the brain due to the delivery of nutrients and oxygen. This is an excellent supplement, however it frequently causes flushing, even at the lowest concentrations. It is best to find alternative ways to enhance cognition as this is usually too much for rosacea sufferers. Vinpocetine— Vinpocetine is one of the top three supplements currently on the market due to its amazing actions on the brain. Vinpocetine is a novel dietary supplement derived from the lesser periwinkle plant Vinca minor. Since it was first synthesized in the late 1960s, vinpocetine has been used to maintain and improve brain health and cognition. It is widely used in Japan and many European countries to treat a number of cerebrovascular diseases.As a dietary supplement, vinpocetine offers potential neuroprotective effects as well. The main action of vinpocetine is to specifically enhance blood flow to the brain. The main problem is that this great increase in blood flow must travel through the face to get to the brain — needless to say, this is often a big trigger to rosacea sufferers. It may help some to decrease the dose from 10 mgs to 5 mgs for 4 weeks and keep track of any increase in flushing or breakouts that occurs within one to four hours after taking Vinpocetine. This is such an effective supplement for the brain that even if 5 mgs does increase rosacea flares, it may be worth decreasing the dose even more to just 2.5 mgs per day and evaluate your rosacea in a month. L-Arginine and L-Citrulline— In today’s health conscious world people who exercise/weight-lift frequently require nutraceutical help to achieve their desired level of fitness. Two of the hottest exercise enhancers are L-Arginine and L-Citrulline. Both of these ingredients increase the production of nitric oxide — which is responsible for muscle endurance, muscle growth, muscle recovery and tremendous oxygen and nutrient delivery hours after any aerobic or anaerobic event. They work. Their primary mechanism of action works by increasing the production of nitric oxide in the walls of blood vessels and the cells of muscle fibers. They also directly impact the mitochondria in active cells, helping to produce ATP. The production of high levels of nitric oxide and ATP (both very strong triggers for rosacea flares as demonstrated in studies by the National Rosacea Society) are not good for most rosacea sufferers, at any dose. They are just too potent. High Doses of Amino Acids and Protein (Whey or Egg-Based)— People who exercise or weightlift frequently often supplement with various types of protein to increase their endurance and maximize muscle growth. Many clinical studies support the role of proteins in muscle endurance, strength and growth. For rosacea sufferers, the primary problem is that protein derived from filtered whey or egg white protein increases the bodies’ metabolic rate and thermogenesis — even when taken without exercising. This means that they are triggering the release of potent dilators (i.e. increased metabolic rate) and stimulating dilator nerves and hormones in an attempt to decrease internal body heat triggered by significant increases in thermogenesis. Most avid sports enthusiasts take 50 to 60 mgs or protein at one setting. This is a very strong rosacea stimulus.Clinicians recommend that rosacea sufferers take no more than 15 to 20 mgs in an eight hour periodin order to reduce the increase in metabolism and thermogenesis while still supplying the muscles with adequate protein. This protein reduction works for many and still allows for surprising gains in the gym. Comment Section: We would like to hear from you. Have you been having difficulty controlling your rosacea triggers? Are you taking any of the vitamins and supplements in this article? 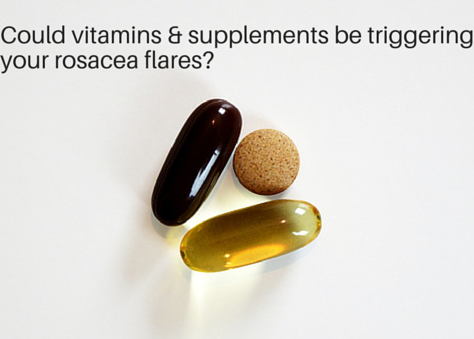 If so, were you aware that the listed vitamins and supplements could potentially contribute to your flares and triggers? 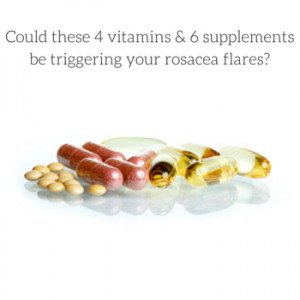 We hope you found this article on rosacea triggers potentially activated by vitamins and supplements informative.